On Sunday 7th December we will have been a community partnered library for a year, run completely by Volunteers. On Saturday 6th December come and join us for a celebratory coffee morning. We are also planning to open on Wednesdays from the 1st January 2015. 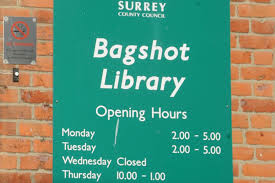 If you are interested in joining our fabulous group of volunteers please contact me at Bagshot villagecommunitylibrary@gmail.com. Full training will be given. On Sunday 7th December we will have been a community partnered library for a year, completely run by Volunteers. On Saturday 6th December come and join us for a celebratory coffee morning.